A volunteer firefighter accused a career firefighter of an assault when they should have been fighting a house fire Sunday afternoon. Chris Gordon reports. A volunteer firefighter accused a career firefighter of an assault when they should have been fighting a house fire Sunday afternoon. 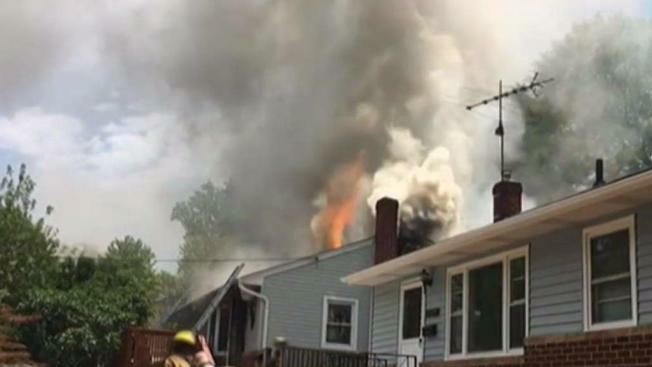 Firefighters quickly controlled a smoky blaze on Ruatan Street in Berwyn Heights, Maryland, but afterward, a volunteer complained about being pushed by a Prince George's County Fire and EMS officer during an argument. "There was definitely a visible disagreement on the front patio, but I couldn't hear anything," said a neighbor who asked to remain anonymous. "But you could tell they were getting into some type of argument." "Kind of like a little nudge and such," neighbor Caitlin Goforth said. "Not punching or kicking or anything like that." “Based on our zero tolerance with workplace violence, both of those firefighters were removed from emergency operations immediately, and an investigation is now ongoing as to what exactly occurred and what should happen – is any additional disciplinary action required,” Prince George’s County Fire and EMS spokesman Mark Brady said. The volunteer asked Berwyn Heights police to investigate. Berwyn Heights Police Chief Ken Antolik said it is too early to say whether criminal charges will be filed. “Allegation at this time is a second-degree assault, which is a misdemeanor, and we will investigate that and file a charge appropriately once it’s been reviewed by the state’s attorney,” he said. Brady said he wouldn't categorize the incident as a feud between volunteer and career firefighters. "What this was was something that occurred between two firefighters at the scene of a fire ground that violated our strict rules as far as workplace violence goes," he said. In May, two volunteer firefighters were tried for hitting a career firefighter and blocking the door at a burning house near Hyattsville in December 2015. They were acquitted after a week-long trial. Prince George's County Fire Chief Ben Barksdale said their should be no difference between in how career and volunteer firefighters are valued.